In the spring and summer of 1525, peasants and farmers throughout German speaking Europe staged a popular revolt now called the Deutscher Bauernkrieg. At the heart of the matter was an oppressive system of taxation run by the Roman Catholic Church, in which little or none of the revenue was used to improve life locally. Often, action was lead by Protestant clergy, but to little effect against the mercenary armies hired by the aristocracy. In the end, up to 100,000 of the poorly armed and organized peasants were slaughtered. Along the banks of the Danube River in southern Germany lies the ancient city of Ulm. 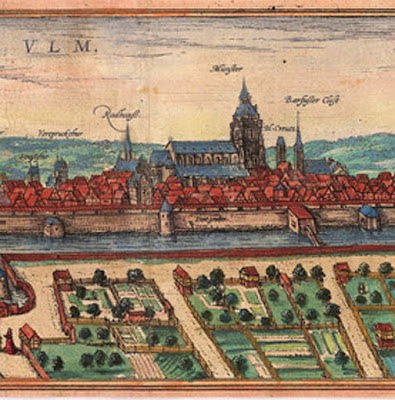 Besides being the birthplace of Albert Einstein, Ulm was, in the sixteenth century, near the center of the Peasant’s Revolt, which brings us to a curious story which traces the migration of a technical recipe from Ulm over the alps to Venice, then to Sienna and finally Florence. The recipe is for the metal alloy to make mirrors, and it is told from one friend to another while chatting amiably in Venice. But nowadays most of the masters who make them take three parts of tin and one of copper, and melt these together. When they are melted, for every pound of this material, they throw in one ounce of tartar and half an ounce of powdered arsenic, and let them fume and melt and incorporate well. To be clear, the tartar, saltpeter and alum act as a surface flux - they form a layer that floats on the liquid metal, preventing oxides from forming, which can foul the melt. their addition does not change the base alloy composition. The similarity of the two recipes alone is not enough to draw any conclusions. Biringuccio himself reports that the contemporary artisans favored the tin rich formulation. However, there are other details to consider. The Sienese born Biringuccio was something of a hero in Florence where Antonio Neri was raised. The famous metallurgist helped cast cannons, mortars and guns for the Florentines to defend themselves in the late 1520s, when the city was under siege, just a few years after Biringuccio’s conversation in Venice with his German Friend from Ulm. Both passages go on to cover much of the same ground, albeit with a change in focus reflective of new thinking about chemistry and nature. In one sense, Neri is paying homage to his distinguished predecessor, and there can be little doubt that he read Biringuccio’s book and its technical recipes closely. Lastly, the story of the burning mirror itself mimics a widely known story about the Greek polymath Archimedes. About 200 BCE during the siege of Syracuse, he is said to have set invading Roman ships on fire with a concave mirror, which focused the radiation of the sun. In fact a depiction of this scene was painted in Florence on the walls of the Uffizi Palace in 1600, when Neri was at the height of his employment for the ruling Medici family. This particular rendering would have been all but impossible for him to miss. 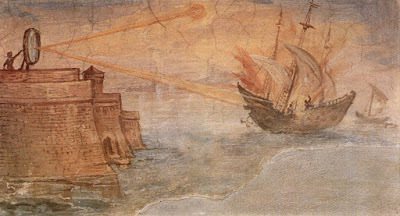 being used to burn Roman military ships. Painted in 1600 by Giulio Parigi. Antonio Neri, L’Arte Vetraria (Florence: Giunti, 1612). p. iv. Ibid, p.126 (in original, ff.41r-44v). Special thanks to Jamie Hall (@PrimitiveMethod) for inspiring this post.